¿Qué problemas tiene tu página web y cómo podría mejorar? ¿Cuales son los frenos a la compra de productos y a la contratación de servicios por Internet? ¿Cómo podemos convencer a las PYMES de la necesidad de innovación en Internet? In the instant age that design has evolved into recently many of us often stray away from the basics. If you had a professor in college who taught you the fundamentals of design these may be engrained into your head. For the self-taught, you may have a book on your desk with these very principles. However, the more and more people that flood the internet for design content need to learn the basics before trying to make a stellar gradient in Photoshop. While this is cool and amazing right now, there will come a point where this style is strayed away from and a new style is made. In history, this lesson has repeated itself with movements like the Bauhaus and Swiss Modernism and will soon come label our current trends as part of history. The fundamentals of design will however, never change. They are the glue that holds the industry together and we need to learn & take them to heart. Arranging parts to achieve a state of equilibrium between forces of influences. Interaction of contradictory elements. Expresses the duality seen in opposites. Establishing centers of interest which focus the viewer’s attention. If all the elements are given relatively equal weight, there will be no emphasis. Both implied and actual, they help guide the eye and mind movement of the viewer. They can also bind the work into a single entity. The size relationship of parts to the entire work, and each to the other. Very often associated with figural art. The real apparent size of an object seen in relation to other objects, people, its environment, or the proportions of the picture plane. The recurrence of a design element coupled with a certain order to the repetition. Provides continuity, flow, direction forces etc. The force operating within a work of art which can give it the appearance of oneness or resolution. The consistency of the concept. When a a variety of these are combined a design becomes very successful and hard to ignore. It is something that commands attention, guides your eye through and keeps you visually entertained. Combining these together is referred to as Gestalt – a configuration, pattern, or organized field having specific properties that cannot be derived from the summation of its component parts; a unified whole. In the instant design age many of us often stray away from the basics in design. If you had a professor in college who taught you the fundamentals of design these may be engrained into your skull. For the self-taught, you may have a book on your desk with these very principles that you refer to on a daily basis. However, the more and more people that flood the internet for design content need to learn the basics before trying to make a stellar gradient in Photoshop. While this is cool and amazing right now, there will come a point where this style is left behind and a new style is made. In history, this lesson has repeated itself with movements like the Bauhaus and Swiss Modernism and will soon label our current trends as part of history. The fundamentals of design will however, never change. They are the glue that holds the industry together and we need to learn & take them to heart. The real, apparent size of an object seen in relation to other objects, people, its environment, or the proportions of the picture plane. 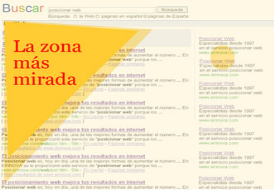 Top Internal Search Phrases - ¿Qué buscan exactamente? El consumo de Internet supera a la televisión en términos de horas diarias en España, según el estudio Mediascope Europe, realizado por la Asociación Española de Publicidad Interactiva (EIAA), que fue presentado en Madrid el martes. Con respecto a la utilización d dispositivos móviles, es estudio sitúa el acceso en 5,5 horas semanales de media con 2,3 millones de usuarios, consolidándose como el tercer pasatiempos favorito tras la lectura de prensa y de revistas. Con respecto al rol que juega internet en las vidas de los consumidores, el 25% de los españoles dice utilizarlo para jugar, el 36% para escuchar radio y el 46% para ver películas. "La innovación tecnológica junto con el continuo deseo de los consumidores de la fusión de los medios de comunicación presenta una gran oportunidad para los anunciantes de ver cómo nos estamos moviendo en el 2010", concluyó Michael Kleindl, presidente de la EIAA. Hago notar que hubo un récord de volumen de negocio en el Comercio online (III trimestre 2009).